French brand Zadig & Voltaire is a ready-to-wear fashion label established in 1997 by Thierry Gillier, the grandson of Andre Gillier and co-founder of Lacoste. 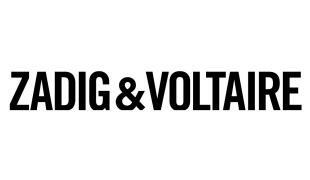 The brand's name was inspired by the Voltaire book, Zadig ou la Destinee. The Zadig & Voltaire style (jeans, boots and leather jackets) gained a solid reputation for accessible, high quality ready-to-wear and soon established a new meaning for 'luxury'. In 2003, Swedish designer Cecilia Bonstom became the brand's creative director. She established the rock spirit and bohemian style of the labe'ls iconic torn t-shirts, and silky cashmere knits.